As a company we do a LOT of giveaways. Whether that's traditional raffle giveaways, social media giveaways of various types, hidden pens, and other random giveaways; it's something we've done for several years. But we've never done done giveaways one the scale you're going to see in 2018. For starters, we're running monthly random YouTube subscriber giveaways. If you didn't know about that, you've still got time to get in on that action. In February we're going to be adding monthly random Newsletter subscriber giveaways AND monthly random Facebook follower giveaways. We have yet to release the giveaway items for the Newsletter or Facebook giveaways in February, those will details are forthcoming, sometime before January 29th. 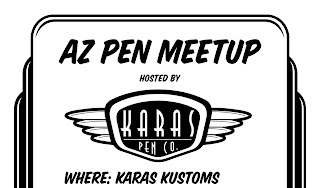 We will also be doing random giveaways to members of the Karas Pen Club throughout the year, these will mainly be limited edition or very small batch/one-off items. If my math is correct that will be roughly 45 giveaways, but that's only the tip of the Giveaway Iceberg. Our big announcement in terms of giveaways will involve a little more than simply subscribing to one of our social media channels. There will be a form you will need to complete that we'd like to get some feedback on to better serve our current and future customers. However, it's going to be worth it because the first 500 people that fill out the form will receive a free pen (one entry per person, duplicates will be deleted). Yes you read that right, we're going to giveaway 500 pens! No they won't be damaged pens, factory seconds, pens we bought from Target, or pens we found on the street. We're giving away Karas Pen Co pens. They will be assembled by our assembly staff and shipped out once you complete THIS FORM. The form is only going to be used internally. Your information will not be given away or sold. We are not asking for any sensitive information beyond a name, shipping address, and an age range. The rest of the form is specifically focused on your preferences in terms of writing instruments. We really want to get a good idea on what YOU want to use, what YOU like to use, and what YOU'D like to see us do. That's not to say we'll be able to implement exactly what you are telling us, but when possible we'd like to use your ideas and feedback to potentially shape new product designs and releases. Are we getting something out of this? Absolutely, we are getting direct feedback, market research per se, but you're getting a free pen and the possibility of seeing your writing instrument desires more better served. We hope you see it as a win-win. So please, we'd like you to fill out the above form, it's fifteen required questions, one paragraph for your direct ideas that is not required, and some required information about you the respondent. Make sure you fill out the form BEFORE you send the link to your friends and family members so you can get in earlier on the giveaway pens since we only have 500 of them. But we would like you to email the link to as many people as you can think of, especially people you don't normally associate with being "pen people". We want their feedback as well, and together we might be able to convert them to the "dark side" of Pen Nerd-dom. Thank you for being such an integral part of Karas Pen Co and what we do. For taking the time to read this and complete the form and for being a part of our future as we go into 2018! The journey continues this year to new and amazing places; trust me you won't want to miss what we have coming this year! 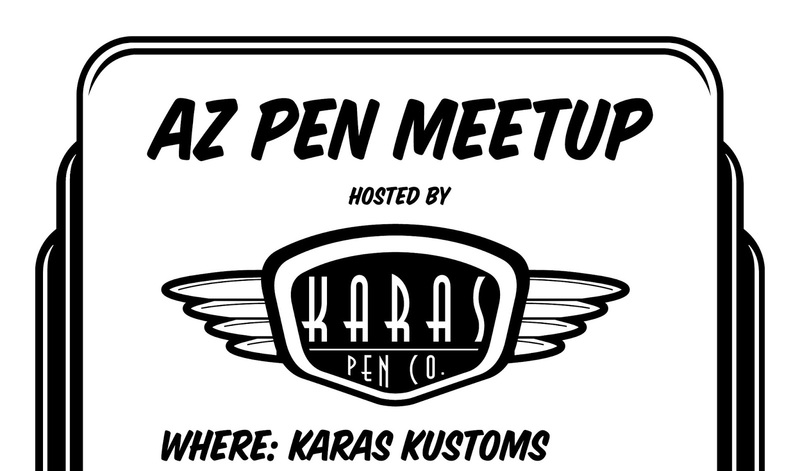 We just wanted to send out a reminder that we'll be hosting our monthly Arizona Pen Meet Up, Saturday March 11th, from 4-7 pm at the Karas Pen Co facility (126 S. Country Club Dr. Mesa, AZ 85210). We'll have complimentary beverages and snacks available. Our pens will be on display for anyone to try out. We'll have the shop open for casual walk-thrus. We'll be happy to answer any questions you may have about our brand but also about pens and ink in general. Paul will be available for discussion on vintage fountain pen and pen repair if necessary. We look forward to hosting you this weekend. We still have a few of the Knox Series pens for those of you that wanted an up close and personal look at them, and we can explain the process a bit better that goes into creating them. We'll also have the Hix Design collaboration on display for people to try out and handle. 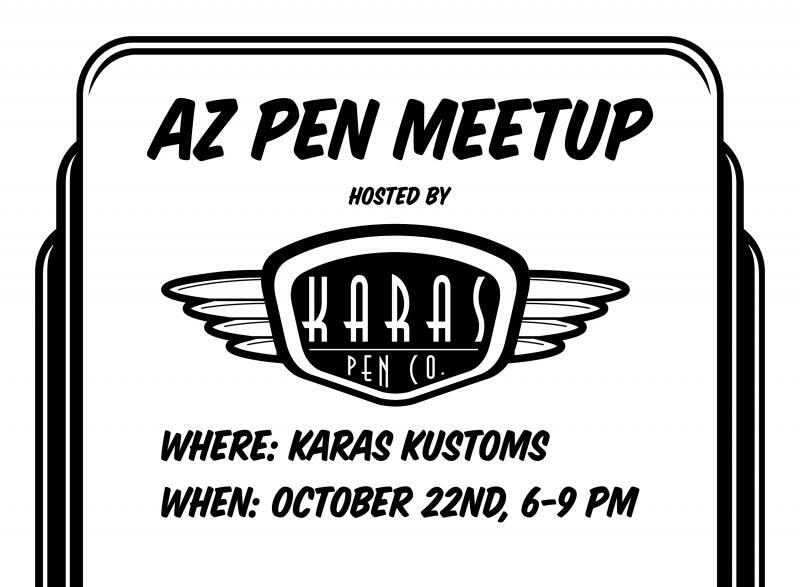 Join us Saturday, October 22nd, 2016, 6-9 pm, for the first Karas Pen Co sponsored Arizona Pen Meetup. The event will be held at the Karas Kustoms shop (126 S. Country Club Dr, Mesa, AZ 85210, on the northwest corner of Country Club and Dana ). We will have the full line of Karas Pen Co pens available to sample as well as any other pens hanging out around the shop. Tables will be set up to easily share pens, chat about all things writing, and generally as a way to foster the Arizona Pen Community. A brief tour of the shop will take place shortly after 6 pm. Afterwards we invite everyone to sit down, ask questions, try out pens, and enjoy an evening with like-minded pen enthusiasts. Beverages and snacks will be provided. Parking is available along Dana on the side of the shop. Please RSVP HERE. We hope everyone is having a great summer so far. Here in Arizona we are on the cusp of the monsoon season where we have hot, sunny temperatures mixed with dark clouds, and lightning filled thunderstorms. You can be getting sunburned one minute, and drenched in rain the next. It makes for some beautiful scenery and once you experience it, you will never forget it. This yearly seasonal weather pattern has inspired our latest experiment in pen-making. We have been experimenting for a while with different materials and finishes and have come up with some pretty cool results. This new pen represents the Arizona monsoon season, but in pen form. The orange body represents the heat/sun, the grey cap represent the storm clouds and silver grip sections represent the lightning that so often comes during our monsoon season. So, to celebrate some of the success we have had with some of the new finishes, we are going to try something new. Instead of our usual method of product testing, we are going to include more community members to give us feedback on our latest endeavors. 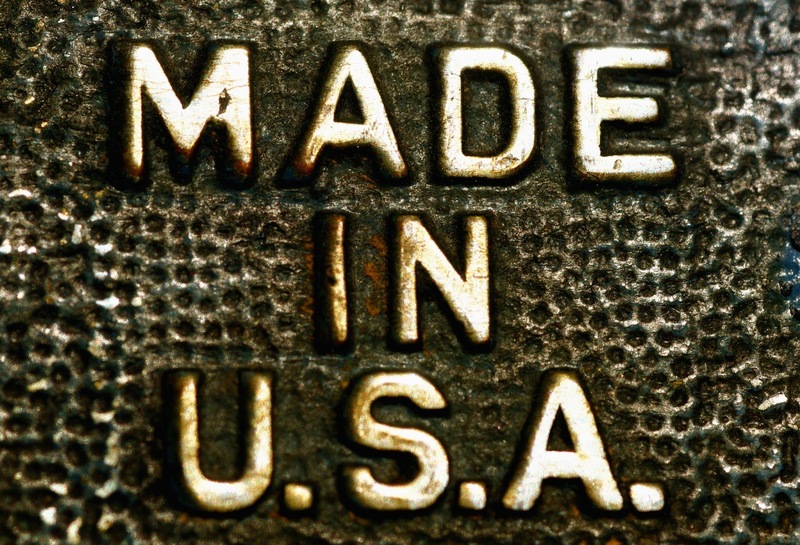 Write us a short original essay on the topic “Made in America” and email it to us with the subject line “Monsoon Essay”. You don’t have to be a great writer, just tell us a story. Create original artwork inspired by “Made in America” and share it with us via email(subject line “Monsoon Artwork”) or Instagram (#monsoonreview). Please create something new, nobody says it has to be fancy, but don’t reuse old artwork. Artwork from all ages, including children, is encouraged. Take an original photo or video depicting what “Made in America” means to you and post it on Instagram with the hashtag #monsoonreview and tag @karaskustoms and @karaspenco. We can’t wait to see what you come up with. We will be choosing 3 people per category in a completely biased method based on our tastes and preferences. This is not a contest, we will pick our favorites in each category and that is who will win. Each category will be judged by a different employee, so you can enter each category to increase your chances of winning. Enter as many times as you want, but each entry must be unique. We will post the winners and their entries on this blog (http://blog.karaskustoms.com/). We will announce the winners on August 12th, 2016. You will have 48 hours to respond before we choose another winner. We are asking all winners of this giveaway to provide us with a review of the Monsoon pen. This can be as simple or as complicated as you wish, we just want to hear your thoughts. Good and bad, it doesn’t matter, but we want to hear from you. We obviously can’t make you review this pen if you are chosen, but it would be awesome if you did. Once again, we will choose the winners on Friday, August 12th. Good luck! I’ve waxed poetic about my love of both history and pens on this blog in the past. But I figured we could look at a larger overview of the American pen manufacturing scene, starting in the late 19thcentury and moving to present day. There is a surprising number of major pen brands that started in the United States. Pen companies that were integral in technological improvements in writing instrument design and function. But those companies have “passed the torch” and there are numerous small companies that are carrying the love of writing into the 21st century and against all odds are succeeding in providing amazing writing instruments to a generation who have typed more than written. Let’s dig into this by taking a trip back in time. Dips pens, calligraphy pens, and even reservoir/fountain pens were the popular means of writing outside of lead stick pencils throughout most of the 19th century. In the 1880s a two companies were founded that would change the landscape of pen manufacturing and drive the pen making revolution in America. In 1883, Lewis E. Waterman filed a patent for a new fountain pen feeder design that would allow for more precise control over ink flow. The feeder design utilized channels to moderate and control the ink to eliminate blotting when writing. In conjunction with this feeder design patent he founded the L.E. Waterman Company to make pens that featured this design. Waterman Pen Company would become one of the fountain pen giants not only in America but worldwide and is one of the few remaining first-generation fountain pen companies. 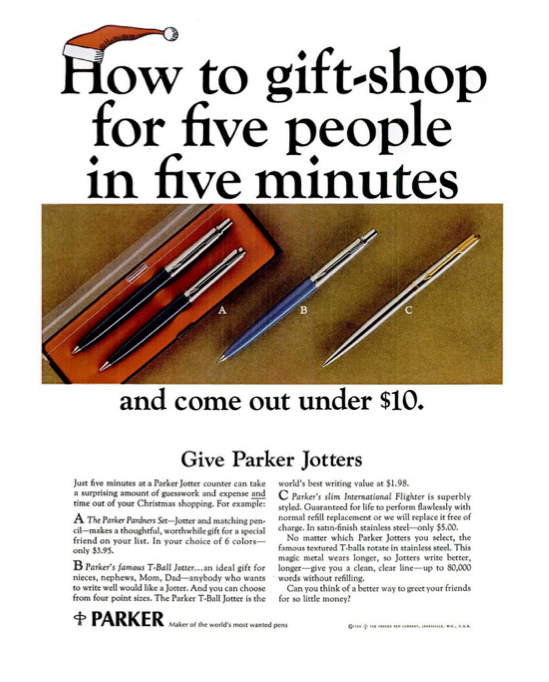 The Geo S. Parker Pen Company was founded in 1889 to make pens better than those being made by John Holland. 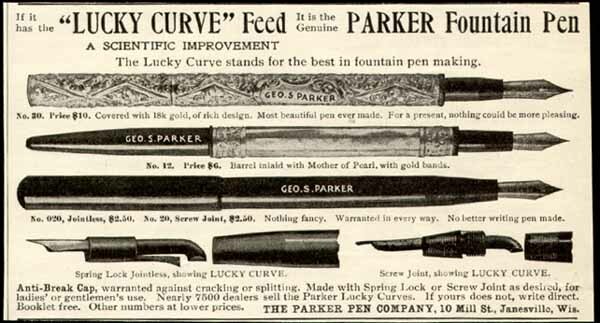 From the outset, Parker succeeded in making higher quality pens than most of his competition but in 1894 he made another major advancement with the invention of the Lucky Curve feed. 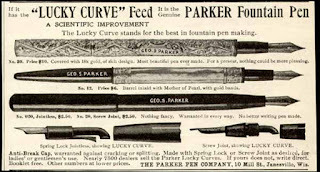 The Lucky Curve feed fixed the problem of ink buildup and blotting when the pen first comes into contact with the paper after being capped. With the Lucky Curve design it caused the ink to backflow into the pen when the pen was capped and fixed the blotting issue. 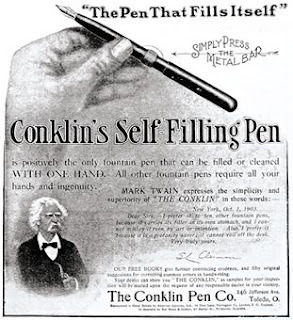 In 1897 Roy Conklin invented the first working self-filling fountain pen. By 1902 he had received the patent, incorporated, and was producing the Cresent-Filler pen for the Conklin Pen Company. The design was so successful that Mark Twain was outspoken in his preference for it and the company kept the filling system into the 1920s. Conklin began to decline with the invention of a better filling system. Walter A. Sheaffer, a jeweler, patented his remarkable lever filling system in 1908 and in 1912 started the W. A. Sheaffer Pen Company and began mass producing pens with the lever filling system. Ultimately the system was less efficient than the crescent filler, but it was also far less cumbersome and more elegant and became much more popular with other pen manufacturers, even Conklin who adopted it in the late 1920s. By 1927 Conklin’s competitors were vocally advertising the problems with the crescent filler, and they began to slowly fall out of favor with fountain pen users. 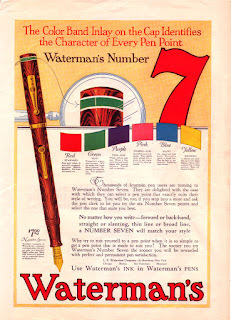 The Wahl Adding Machine Company absorbed two companies in 1916 and 1917, first Keenan & Company makers of Eversharp pencils and second most of the assets of the Boston Fountain Pen Company. They formed Wahl-Eversharp and using Boston Fountain Pen Company began making superior quality fountain pens. They experienced great early success and ultimately removed Conklin as one of the Big Four in the American fountain pen empire. Contrary to popular belief the first ballpoint pen wasn’t sold at Gimbel’s in 1945, the story of the ballpoint style pen goes all the way back to 1888 when John Loud, a leather tanner, applied for a patent that used an ink reservoir and a large ball tip design to mark hides. The pen was never put into production, and neither were the other several hundred similar patents that were applied for over the next 30 years. American ballpoint pens came about when Milton Reynolds went on vacation in Argentina and visited a pen shop that was selling Hungarian made ballpoint pens. 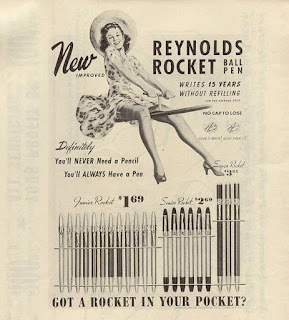 He found out the patents had expired and as such he founded the Reynolds International Pen Company, bought as much non-war allotted aluminum as possible, hired 300 workers, and started out stamping pens. He made millions of pens and orchestrated the Gimbel’s sale in 1945, a master event that was well advertised in how the pen would change the writing lives of Americans because it advertised a pen that could write for two years without needing to be refilled. The problem was the pens didn’t work well and after a few years the interest in them waned and a once expensive pen ($12.50 in its initial Gimbel’s release) couldn’t be sold for as low as 19 cents. Just a few years later Fran Seech, an chemist, lost his job for a ballpoint company that was going out of business. Seech had formulated a new ink that would allow better function in a ballpoint pen, and in 1949 was approached by Patrick Frawley who purchased the new ink and formed the Frawley Pen Company. He introduced a new ballpoint pen, this one was retractable and featured the new no smear ink. Knowing he was up against the stigma that ball points smeared and wouldn’t wash out of clothes, he initiated a strange sales technique. His salesman would barge into offices and pen stores, scribble on the owners shirts, and say if the ink doesn’t wash out that they’d buy the owner a more expensive shirt. The ink did wash out, and word got around that a new, usable ballpoint pen was on the market. Frawley named the pen the “Papermate”. 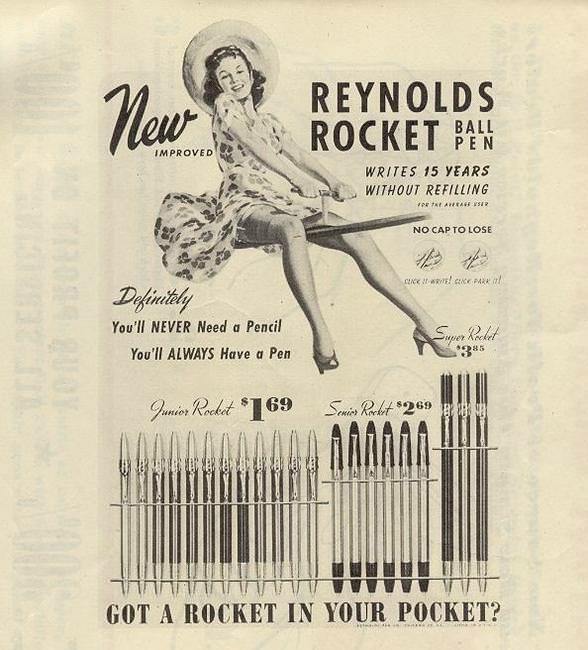 Fountain pen companies had bought into the ballpoint pen before and during World War II when pilots came into contact with the same Hungarian Biro pens that inspired Reynolds. 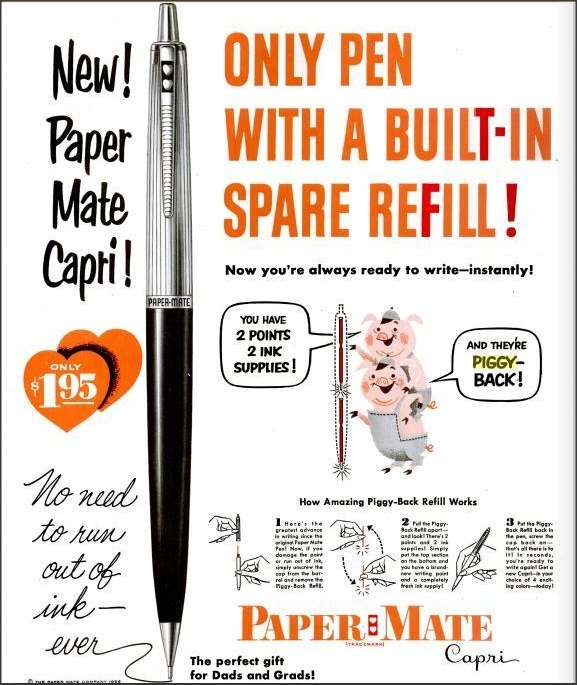 They even received government specifications, but most of them dropped out of the ballpoint business until the 50’s due to the problems in ballpoint technology. 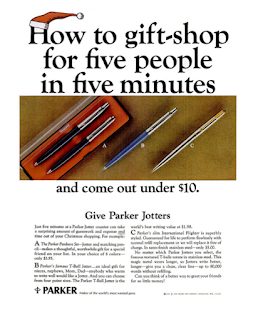 Parker came back to the ballpoint pen in 1954 with its iconic Parker Jotter. A classic design with metal body and mechanism but a relatively low price it was done in the same sleek designs of the Parker fountain pens of the day. The pen has become so popular it influenced the Parker style refill that is still one of the most popular ballpoint refills. I’ve opined the reduction of the once mighty pen to a mere disposable item numerous times. So I’ll attempt to steer clear of that topic, and try to focus on the current and future landscape of American pen manufacturing. For reasons that I hope are obvious, this won’t be a historic look at these manufacturers but a company and product overview, and Karas Pen Co won’t be one of the companies featured. Rather I will go over companies that Dan and I frequently refer people to if they are looking for a pen design or aesthetic we don’t currently offer. I am not up to date on the incorporation dates of many of these companies so my list is going to be somewhat random at best. So let’s begin. When someone talks about modern American fountain pen manufacturing, there are really three types of companies that term applies to. The remnants of the Big Four from above that don’t necessarily make pens in the United States anymore but are American owned and operated companies is the first. The second is small-medium production companies that have risen to fill the void left by the first group. The third is a growing amount of custom pen makers that are pushing their “hobby” into viable businesses that are also setting trends in fountain pen aesthetics while mixing in some very traditional techniques and designs. I won’t even focus on the first group except to say you can still easily find Sheaffer, Parker, and Waterman pens from various outlets even office and art supply stores carry them. Wahl-Eversharp was recently revived and is a partnership between an American businessman and fountain pen historian and an Italian manufacturer. 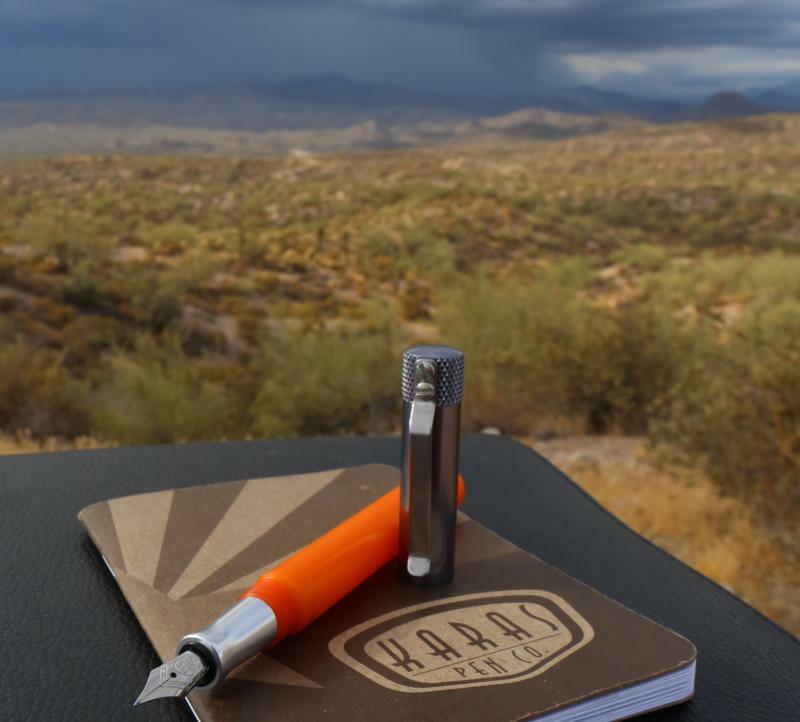 The company is headquartered out of Scottsdale, Arizona with pen manufacturing done in Italy. The second category is where we’ll start. The Bexley Pen Company was founded by a group of fountain pen enthusiasts in 1993 with the idea of reintroducing classically inspired fountain pens to the modern fountain pen community. The manufacture their pens in Columbus, Ohio and make a range of pens in different materials and looks, all inspired by the golden age pens. Their pens can be found on their website and through numerous dealers. Franklin-Christoph has a storied past as a small American company that goes all the way back to 1901, when the company began manufacturing ceramics. Over the years the company was known as a manufacturer and importer of quality goods and moved around the country. In 2001 they featured their first fountain pen the IPO. The company has continued to grow and is seen as a major player in American fountain pen community. They make classically inspired and modern designed fountain pens out of various materials in their North Carolina headquarters. Their pens can be found on theirwebsite. Edison Pen Co. was founded in 2007 by Brian and Andrea Gray. Brian had been a pen enthusiast for years when he bought a metal lathe and taught himself machining. As they began to grow, Brian quit his day job to focus on pen manufacturing. They grew the company, hired a couple more people and now make several different pen designs in a myriad of color options. Brian also began working with alternative filling systems based on the Sheaffer Touchdown and Parker Vacuumatic as well as a bulb filler option. You can find Edison pens on their website as well as on Goulet Pens. The third category is quite large and growing probably as I type this. I’ll focus on a few of the Makers we have interacted with. Newton Pens is owned and operated by Shawn Newton in Arkansas. Shawn is a former teacher that ran a successful Kickstarter campaign in 2011 to fund his desire to make his own custom pens. Since that time Newton Pens has grown to the point where he left his job teaching to make pens full time. He created the Newton Pens Scholarship which sells postcards featuring student art. Then he awards high school students with $1,000 scholarships to help assist them with college. He is pushing the design aesthetic of fountain pens in a more modern, art-inspired direction with the release of his Shinobi, Prospector, and Breaker but keeping a traditional feel with the addition of the Temple and Vapor pens. You can find his pens on his website. Carolina Pen Company is located in Aiken, SC and was formed by Jonathon Brooks in 2009. His goal is summed up in his slogan, “Putting your personality in writing” and is summed up in his ability to make pens out of nearly any material. Beyond that he makes custom resins in a HUGE variety of colors, they have become so popular that other custom pen makers use his custom resins. He has recently branched out into traditional Japanese style Urushi technique and is one of very few American pen manufacturers making pens in this technique. He pens are available on his website. There are numerous other custom pen manufacturers; Ken CaversCustoms Pens, Scriptorium Pens, and Fisher of Pens are three of the largest. But more and more people are moving into the “hobby” and pushing it forward. What about American made non-fountain pens? Well I’ll go through a few of the biggest out there right now. Tactile Turn is a small one man machine shop in Texas. Will Hodges founded Tactile Turn in 2012; he designs, prototypes, and creates production runs of high quality writing instruments. He has had success via Kickstarter and on his website and has recently begun selling his newest pen the Gist fountain pen via Vanness Pens and Goulet Pens. 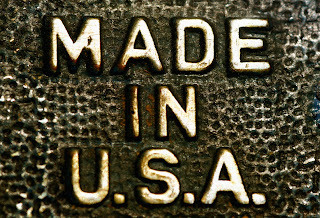 Machine Era is a small company located in Richmond, VA. They don’t just make pens, but their pens are some of the nicest looking and functional pens on the market. They also make wallets and other accessories out of various metals. The design and machine their products on site and sell via their website and numerous retailers. 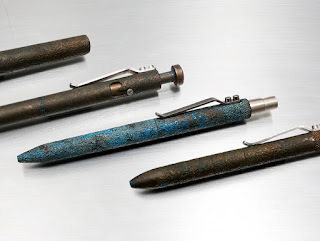 Schon DSGN is located in Massachusetts, where Ian Schon creates some truly amazing pens. He currently only has one design, but offers it in numerous materials and is now offering small batches in special customs colors. The pens are elegant but also indestructible and machined to some of the best standards you will find. You can purchase his pens on his website. As you can see, American pen manufacturing has a long and storied past. Some of the greatest technological advances in writing instruments came about in American companies. The advent of two World Wars didn’t stop pen manufacturing, quite the opposite, early advanced plastics came about because of shortages from World War II. 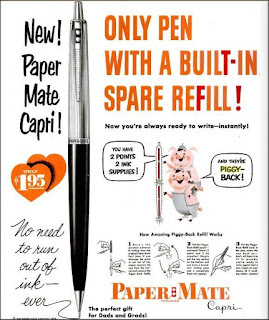 And pen manufacturers during that time continued to push forward with advances in both functionality and aesthetics. That same spirit continues on today, and I’ve only listed a few of the American makers that are driving the pen movement forward. You can find hundreds more making pens and pencils in a variety of styles out of a whole laundry list of materials. Best thing about that, is that pen lovers like us all benefit from the fact that so many American companies are making pens, but more-so they are making pens in the United States, employing their friends and neighbors, providing a living wage to those employees, and making quality products. So when you consider your next pen purchase look at these manufacturers first.